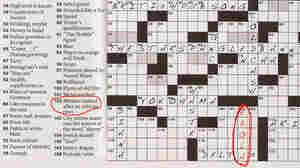 May 29, 2016  Puzzlemaster Will Shortz challenges Daniel Rosenblum and NPR's Rachel Martin to a celebrity quiz in this week's puzzle. May 22, 2016  Every answer this week is the name of a newspaper comic strip or cartoon, past or present. Identify the funnies from their anagrams. May 15, 2016  Given two kinds of people or things, name something they both do — in three letters. For example, a false witness and a person in bed both lie. May 8, 2016  Given a four-letter word and a six-letter word in this week's puzzle, rearrange the letters of one of them to get a synonym of the other. May 1, 2016  Every answer this week is a phrase in the form "___ and ___." We give you rhymes for the two missing words; you complete the phrases. April 24, 2016  Every answer this week is a familiar two-word phrase or name in which the first word ends in "X" and the second starts with "C" (as in XC, the Roman numeral for 90). What Do You Get When A City Slicker Drops His Vowels? 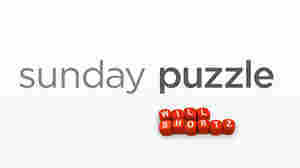 April 17, 2016  Answer: the Sunday Puzzle! In each word given this week, ignore the vowels. The consonants in each word are the same consonants in the same order as in the name of a well-known American city. March 27, 2016  Every answer in this week's puzzle is a five-letter word said twice, in two different meanings. Answer the clues to get the phrases. Between Alphabetizing And Best Guesses, Can You Find This Week's Answers? November 29, 2015  Given a category, and a thing in the category that closely follows the name of the category alphabetically, answer with the only other item in the category that fits between them alphabetically.